The Blues Kitchen has gained quite a reputation for bringing some of the deep south's best barbecue to London (you can see another Weekend Notes writer's article on the food here) at its three outposts in Camden, Shoreditch, and Brixton. But did you know that they host pretty incredible nights out as well? If you're looking for soul, swing, jazz, or funk, you need to make Blues Kitchen your next stop for a night out. They have a full lineup of great live music acts, with normally two to three bands performing a night on the weekends, followed by a DJ. They also have some themed nights, ranging from 60s nights to cult film nights like Pulp Fiction night and everything in between, so there really is something for everyone. When you walk in, there's a seated area on the left used for dining earlier in the day and for table service once the clock hits 10. They have a large, central bar that wraps around giving a full 360 degrees of service, with a solid selection of house drinks. They boast an even more impressive selection of whisky based drinks, from sours to pickles and loads of other crazy (but interestingly tasty) concoctions. Past the bar is where the night truly begins: the stage and dance floor. Blues Kitchen is particularly selective with who they book, so you know it's always going to be quality. 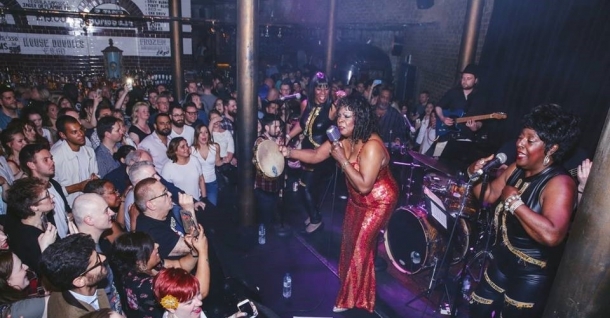 They've also maintained a close working relationship with one of my favourite current soul and funk bands, Atlantic Soul Orchestra, who do true justice to the songs they cover. If you're looking for a different kind of night out away from the typical club scene, Blues Kitchen is the place to be.